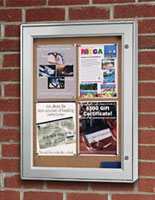 These outdoor bulletin boards are designed to stand up to the weather. 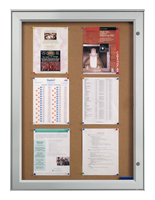 These enclosed cork boards have durable aluminum frames and several weather seals that keep the rain out. 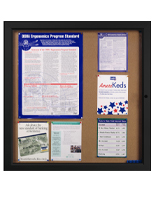 Optimal for parks and outside of schools or churches these bulletin boards make updates simple, yet seal out the rain and wind. 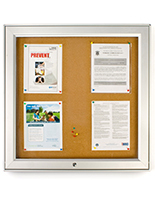 These outdoor bulletin boards, also known as message display cork boards, have locking system that can keep important information from damages. 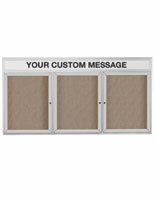 These enclosed cork boards have swing open acrylic doors that can display messages clearly and prevent damages as well. 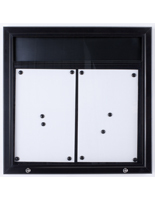 Around the impact resistant acrylic lens is a rubber gasket that makes a waterproof seal between the aluminum door frame and acrylic lens. 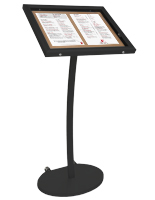 Looking for a weather proof poster holder? We have that. 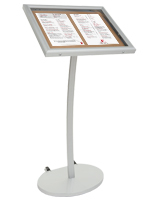 Our ODPH Series are great sellers and are built to last. 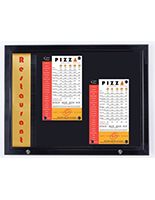 These outdoor bulletin boards, also known as enclosed bulletin boards, have high quality aluminum frames that can hold the cork boards strongly. 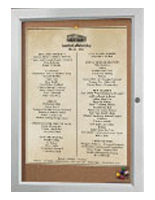 These highest quality outdoor corkboards are built to last long in tough weather. 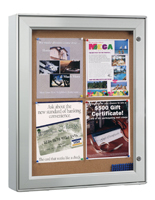 Aluminum frames are used in these durable outdoor bulletin boards. 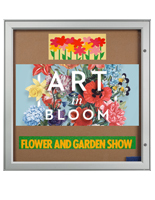 Aluminum framed corkboards are better than wooden framed ones for outdoor because aluminum frames can resist weather damages. 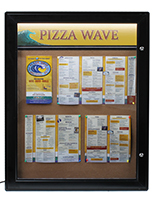 What features do these Outdoor Bulletin Boards have? 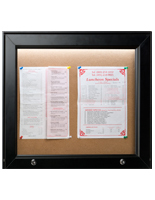 These enclosed cork boards have aluminum frames that have rubber gasket sealed edge for weather proof. 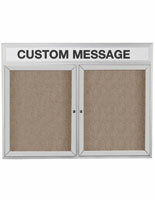 These cork display cabinets come with acrylic door and locking system to protect important messages from damage. Illuminated lights are great for catching people’s eyes. 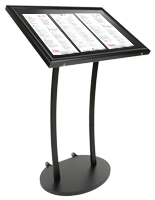 There are different choices of surface materials available for all your needs. 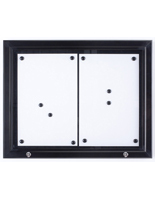 These outdoor bulletin boards for walls have illuminated lights concealed inside of the cabinets. 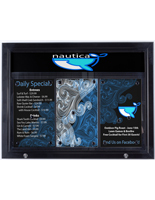 Illuminated lighting is great to catch people’s attention in daytime and make people see messages in nighttime. 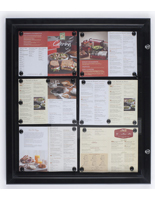 These illuminated cork boards, also known as outdoor bulletin boards, have locking system on the cabinets. 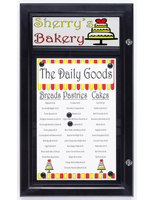 Lockable bulletin board cases are suitable for exterior uses for businesses, schools, and communities. 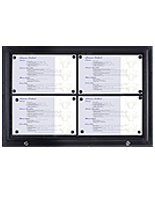 These outdoor bulletin boards have magnetic surface that are easier to change messages. 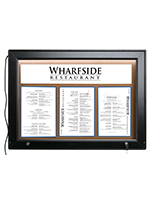 Also available is a floor standing 22" x 28" weather resistant poster frame which can be quickly brought inside after store hours. 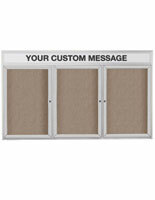 These enclosed bulletin boards also come with vinyl surfaces and customizable headers for adding company name or slogan. 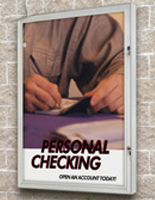 Eye-catching headers are helpful to promote your business and draw attention from the public. 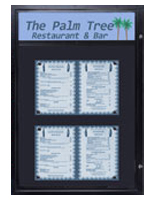 These information boards allows for quick and easy post changes, with swing-open doors. 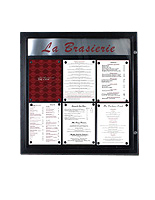 These enclosed corkboards with vinyl fabric surface are moisture resistant for both exterior and interior uses. 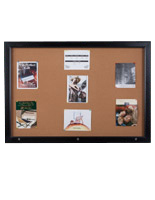 These corkboards come with various sizes to fit all your needs. 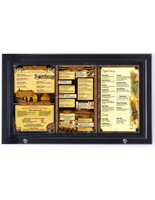 Displays2go is a manufacturer and supplier of enclosed cork board & letter board merchandise. 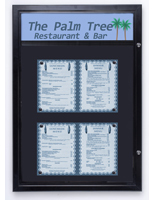 Our large selection is in stock and waiting for your order. 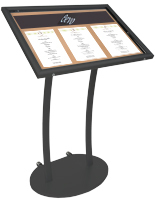 In addition to our cork board selection, Displays2go is the leading source for stock and custom point of purchase displays. 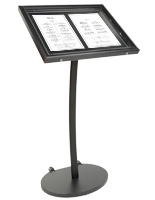 We have a huge warehouse, which we use to keep over thousands of different products in stock. 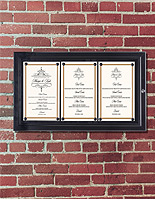 In most cases orders received before 3PM EST ship the same day.